On the morning of September 1, 1893 the area around this sign was the scene of one of the fiercest gunfights in the history of the state. 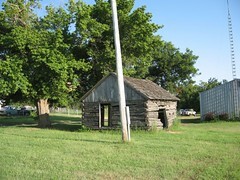 Ingalls at the time was the hideout for the Bill Doolin gang. 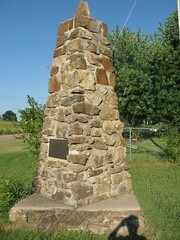 It included Arkansas Tom, Bitter Creek Yocum, and Bill Dalton, a brother of the infamous Daltons who attacked Coffeyville, Kansas. These men in a sense owned the town. Many of the townsfolk were grateful to them because they spent money generously and created much commerce for the growing town. When the lawmen in Guthrie and Stillwater found out the outlaws were in Ingalls they formed a posse to capture them. 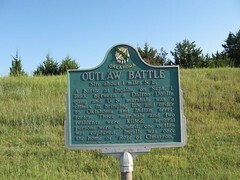 A gunfight ensued and the outlaws escaped with the exception of Arkansas Tom who was captured. 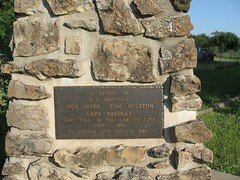 Three U.S. Deputy Marshalls and one local citizen were killed. The Doolin gang more or less fell apart after the Ingalls raid. Site about 1 miles S.E. 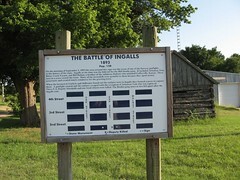 A battle at Ingalls, on Sept 1, 1893. 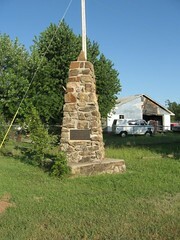 Between a Dalton - Doolin gang and U.S. marshals was a climax in bringing law and order to Oklahoma and Indian territories. Three marshals and two residents were killed; several persons were wounded; one outlaw was captured. 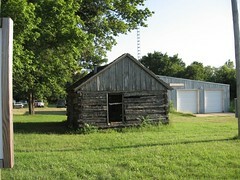 Ingalls was once the home of "Rose of Cimarron."